DC Comics, 2008-11-11. Hardcover. Good. DC Comics. Hardcover. 1401219268 Item in very good condition! Textbooks may not include supplemental items i.e. CDs, access codes etc... . Very Good. DC Comics. Hardcover. 1401219268 Brand New! Not Overstocks or Low Quality Book Club Editions! Direct From the Publisher! We're not a giant, faceless warehouse organization! We're a small town bookstore that loves books and loves it's customers! Buy from us and you get great service as well as a great price! Your business is valued and your satisfaction is guaranteed! . New. DC Comics. Hardcover. 1401219268 Remainder mark . Fine. DC Comics. Hardcover. 1401219268 . New. Dc Comics. Comics & Graphic Novels. New. Brand New: This item is brand new unopened, never used and still in its original manufacturer condition. DC Comics, 2008-11-11. Hardcover. Used:Good. DC Comics. Hardcover. 1401219268 Please allow 4 - 14 business days for Standard shipping, within the US. Thank you for supporting our small, family-owned business! . Fair. 2008-11-11. DC Comics. Hardcover. 1401219268 Brand New ,Original Book , Direct from Source , Express 5-8 Business days worldwide Delivery. . New. DC Comics. Hardcover. 1401219268 Special order direct from the distributor . New. NEW YORK: DC COMICS. First printing of this edition. Hard cover with illustrated dust jacket. Slight wear/creasing on DJ edges. Not price clipped. Black boards with yellow titles on board spine and clock logo on front board in yellow. Graphic Novel;(Trade hardcover). Colour comic strip art. Collects issues 1-12 of 1980s comic series 'Watchmen(the complete story). Location: ELCB3/B Size: 12mo - over 6¾" - 7¾" tall . Fine. Hardcover. First Thus.. 2008. New York, New York, U.S.A.: DC Comics, 2008. Graphic Novels. Illus. 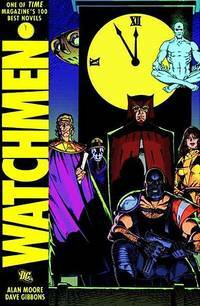 by Dave Gibbons. Fine. Hardcover. First Edition/First Printing. A square solid tight clean unread copy. This copy has some light browning to the edges of the text block which is pretty normal to this edition. Compilation edition that includes material originally published as Watchmen Issues 1-12. THIS ITEM IS IN MY POSSESSION AND WILL NORMALLY SHIP NEXT DAY..
DC Comics. Hardcover. 1401219268 Please allow 4 - 14 business days for Standard shipping, within the US. Thank you for supporting our small, family-owned business! . New. 2008-11-11. DC Comics. Hardcover. 1401219268 Please allow 4 - 14 business days for Standard shipping, within the US. Thank you for supporting our small, family-owned business! . Fine. 2008-11-11. DC Comics. Hardcover. 1401219268 New Condition *** Right Off the Shelf | Ships within 2 Business Days ~~~ Customer Service Is Our Top Priority! - Thank you for LOOKING :-) . New.